Sign up for the newsletter and receive a *FREE* 30 DAY HEALTHY MEAL PLAN! Have you ever had a surprise party thrown for you? I haven’t. Well, actually, once in college, I had a “surprise” party for my 21st birthday – only I knew about it all along and somehow managed to get food poisoning (actual food poisoning, not euphemism-for-hangover food poisoning) so was late to the party and had to keep stepping out for some fresh air so I wouldn’t hurl. Um, surprise? The surprise party I went to last weekend was about 5 million times more successful than that one. My good friend and upstairs neighbor threw the most epic weekend of surprise partying for her husband who just earned his masters degree and is about to celebrate a big birthday. There were decoy plans and special guests and so much Chipotle, I almost turned into an avocado (no complaints). I knew she had her hands full, so I volunteered to make some dessert. And because I am a crazy person, “some dessert” turned into 3 trays of 7 different types of treats, plus Nutella cookie dip (see below, right above the third picture, for instructions). And a cake. Of course, a cake. The story behind this cake is long and hilarious, but only if you’re me, so the short version is this: after I posted these black bean brownies, two friends emailed me the recipe for the best and worst black bean dessert they had ever had. The funny part is that it turned out to be the same recipe. Obviously, I just had to try it! I played around with it a little bit, and it was so delicious that I had to bring it for this party. Not a single person realized it was gluten free, let alone guessed what the secret ingredient is. You won’t either! Thoroughly puree the beans. Like, into teeny tiny specks. There is no better way to ruin a bite of cake than with a chunk of beans. Make sure you are using natural cocoa powder, not dutch-processed. Special Dark is usually my cocoa powder of choice, because I like the super dark chocolate flavor, but I would recommend using natural here because it facilitates rising better. And I love a tall fluffy cake, don’t you? Use salt. The original recipe didn’t call for it, but it enhances the chocolate flavor. Don’t leave the cake out longer than you have to. 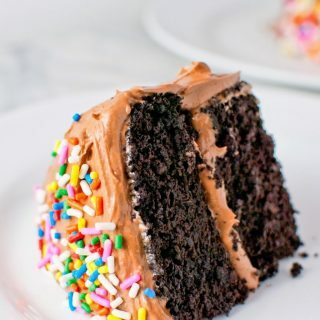 It dries out faster than a regular chocolate cake, so if you are going to bake it in advance, make sure you store it in an airtight container as soon as it’s thoroughly cooled, and don’t take it out until you’re ready to frost/serve it. Once you’ve cut it, if you’re not serving it immediately, a little piece of plastic wrap over the exposed part of the cake would help a lot. I know this sounds excessive and Martha-Stewart-y, but in this case, I think it makes a difference. If at all possible, add sprinkles. You can use any frosting recipe you want for this cake. Because the guest of honor (and everyone else in the known universe) loves Nutella, I threw together a Nutella cream cheese frosting which consisted of 1 cup of whipped cream cheese, 1 cup of Nutella, 1/2 cup + 2 Tablespoons of powdered sugar and a pinch of salt creamed together until smooth. That’s not so much an “official” recipe as much as a guideline if you want to recreate what you see here in the pictures. These proportions make a tonnnn of frosting, and the excess, for the record, makes a spectacular sweet dip for Biscoff cookies, as I mentioned above. While Nutella is always the right answer, this cake truly doesn’t need it. Full disclosure, I don’t think this cake needs anything but a fork and a tall glass of your favorite milk. Thank you to Natvia for providing the ingredients that inspired this delicious recipe. This post contains affiliate links, which means that if you click through and purchase a product, A Clean Bake receives a small commission, which goes toward continuing to bring you delicious, healthy recipes every week. This does not affect the price you pay. Thanks for supporting A Clean Bake! Split the batter evenly between the two prepared pans and bake for 30-35 minutes (mine took exactly 33 minutes) until a tester comes out clean. Cool for 5-10 minutes in the pan, before turning out onto a wire rack to cool completely. To assemble cake, put a dollop of frosting on your cake plate or stand, and center one of the cakes on it. This holds it in place. Put a large portion (1/2 cup, more if you prefer) of frosting on top and spread into an even layer. Add the second layer of cake. Put the rest of the frosting on top of the cake layer and spread it across the top, then wiggle the excess down the sides to cover. Serve immediately, or refrigerate for up to 8 hours before serving. Store leftovers in an airtight container for up to 3 days. This is my favorite frosting recipe, but if you need a dairy-free one, try this version. Did you make this recipe?Mention @nora_acleanbake or tag #acleanbake to be featured! If you enjoyed this post, please leave me a comment and rating! Or, share on Instagram and tag #acleanbake or @nora_acleanbake! This post may contain affiliate links, which means that A Clean Bake receives a small commission from your purchase at no additional cost to you. All proceeds are used to continue to bring you delicious, healthy recipes. Thanks for supporting A Clean Bake! Beautiful chocolate cake, Nora! I’ve baked with black beans, applesauce, lekvar (prune puree) and yogurt, and no one has ever guessed the secret ingredients! I love the story behind the cake recipe (one friend hated it, the other loved it, LOL!). Thanks for sharing and have a great week! Thank you Stacy! It’s so much fun trying all sneak all of the unexpected ingredients into these recipes! Thanks, Colleen! I hope you get a chance to try this! This cake is ABSOLUTELY beautiful! It’s almost too beautiful to eat! I’m also slowly dying over that cake stand. Need it! Oh my god. This looks AMAZINGGGG. That first shot is PURE MONEY! I’m so glad this turned out for you!!!!!!! Did you ever figure out what went wrong with the other girl’s cake?? In any case, that party sounds like it was so much fun and you are a ROCKSTAR dessert bring-er! Holy crap! Probably a good thing I wasn’t there because I would have wanted to try every single cookie plus the dip plus the cake. So. Basically I would have taken over the dessert table. Yep, I think the other cake was a dud because of the cocoa powder she used. It was dutched, so it didn’t react with the baking soda and as a result the cake didn’t rise at all. I even tested this with Special Dark and natural cocoa and the natural rose about 50% more. It really makes a huge difference! Oh yes. Gimme some of that! I just made garbanzo bean chocolate cake and omg, so good. I will be venturing onto black beans now. Also, that cake stand just gets more beautiful every time I see it . Nora, I have no words. Your photography is stunning. 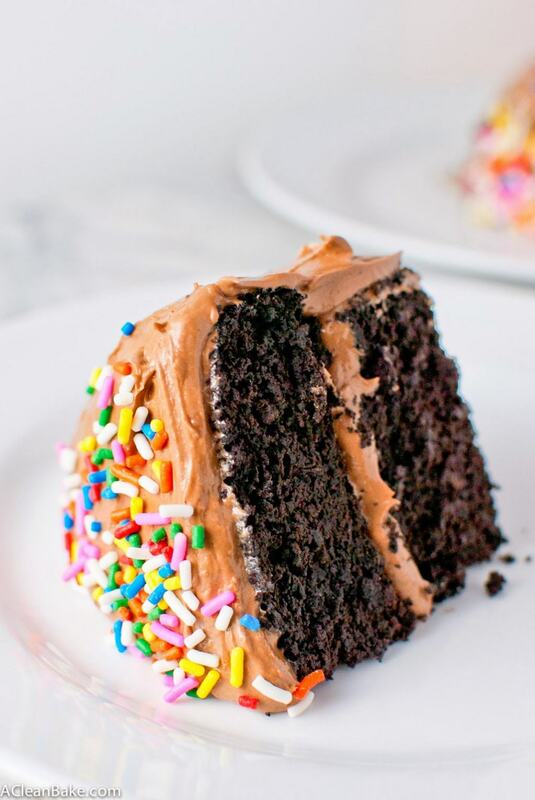 Like, that cake … wow, its all I can do to move away from the picture to the pin button. I cannot get over that it is made from beans! But I’m so glad – I can’t afford the GF flour (and I don’t have to, just for when we have GF friends over.) Love love love this! Thank you so much, Mary Frances!! I know, isn’t the secret ingredient pretty unbelievable? I *TOTALLY* understand the concern about specialty flours. They really add up fast. I am working on more recipes like this one that doesn’t require special flours to make it gluten-free. This cake looks amazing, Nora, and that story about the best/worst black bean recipe is too funny! It was such a funny coincidence! Glad you like the cake, Allie! I saw the inside of this cake on Facebook, and it REALLY caught my attention. Love that you gave us some handy tips for getting the best results, too. Thanks! Hi Helen, I’m so glad the cake caught your eye! It’s a really easy and delicious recipe. Hope you get a chance to try it and thanks for stopping by! This cake looks seriously moist! I still haven’t tried the black bean in baked good thing, but I really want to – the texture looks amazing! 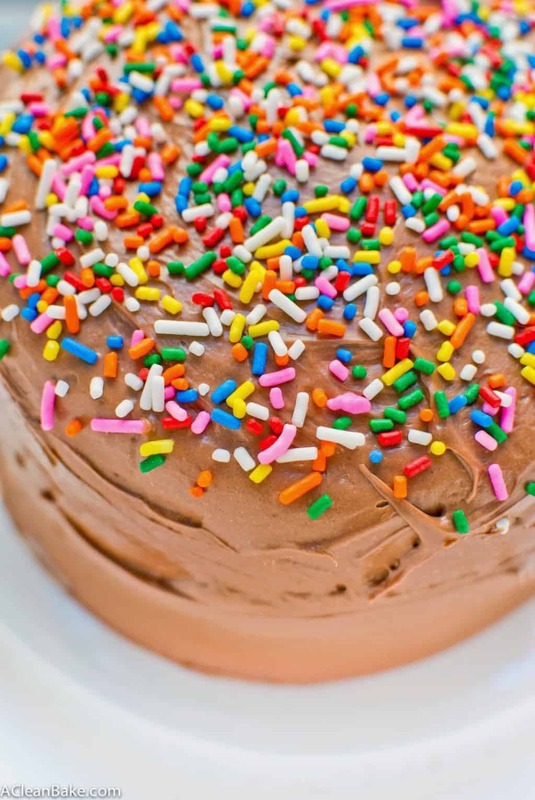 And the frosting and sprinkles – just perfect! Goodness gracious, this looks like quite the treat! I’m pretty much in love. Yeah, totally in love. This cake is truly love-worthy! Hahaha almost turned into an avocado? I wouldn’t complain either. Yummm, I love Chipotle…Wow, your friends really lucked out, with you being the baker extraordinaire and going above and beyond with the baking! 😉 This cake looks so delicious and moist; I didn’t realize black bean could be used in not only brownies but also cake! 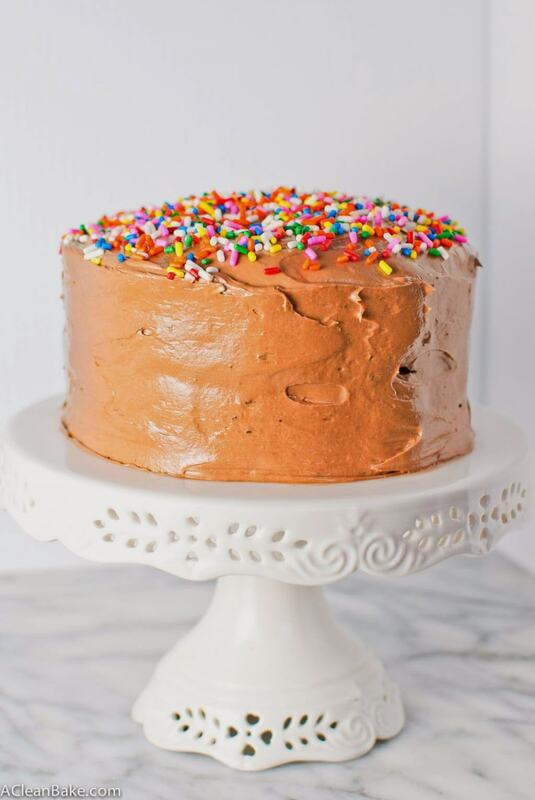 Yessss, Nutella cream cheese frosting…I approve (: What an awesome cake recipe!! Yep, not a bad fate, eh? It’s pretty amazing how versatile black beans turn out to be. I am working on other ways to use them and other beans. It’s such a relief not to use the expensive GF flours sometimes 🙂 And I thought of you when I made this frosting – I knew you’d like it!! Question! I’d like to make this for my son’s first birthday coming up.. Is there any way I could sweeten it with fruit, (bananas or something?) instead of an actual sweetener. Please help! Hi Kara! I wouldn’t recommend using fresh fruit (like mashed bananas or applesauce) because they contain so much moisture that it would really throw the proportions off and you’ll end up with a tense, soupy cake. Although I have not tried it, you might consider using date paste (which is just pureed pitted dried dates; here is one: http://amzn.to/1xBoq5g), which has a lower moisture content. I have never tried this with fruit as the sweetener, so I would love to hear how it turns out for you! Good luck! Thanks, Emilie! Yep, that’s the idea – I try to use little/no specialty ingredients (assuming you don’t consider almond flour, etc specialty)! Great question about the cocoa powder. The short primer on cocoa powder is that there are 2 kinds, natural and dutch-processed. Natural reacts with leaveners to make the cake rise (it has to do with the acidic pH level of it, but I’ll save you the chemistry), and has a milder chocolate flavor. Dutched is the opposite – it has a very dark-roasted chocolatey flavor, but it is not going to contribute to rise. So what does this mean for you? Well, if you are in the US, you’re probably using naturally-processed cocoa powder. Most cocoa powder in the US, unless otherwise marked, is naturally processed. So, if the can just says “cocoa powder” it is going to natural. The exception is some imported European brands, because in Europe it’s the opposite (the default is dutch-processed). So, if you get standard Hershey’s or ghirardelli, or something like that, it should be fine. Yes that was very helpful, thank you!! Have any of you used mayonaise, or tomato soup to make a chocolate cake> They are amazingly super moist. Not the type for gluten free I’m afraid.???? Viola, just so you know, this is a gluten free food blog. However, many of the recipes are naturally gluten free (i.e. you wouldn’t expect them to include any gluten anyway) so hopefully you will still be able to find something you like. I have not tried the mayo or tomato soup based chocolate cakes. They don’t really appeal to me. This cake looks amazing! Where did you get your sprinkled from? Also, do you think I could sub garbanzo beans for black beans? Hi Holly! If you’re looking for naturally-dyed sprinkles, here are the ones I use: http://amzn.to/2aSnBwx. I get them on Amazon. Welcome to A Clean Bake!